As I was putting together my end-of-the year posts and thinking about my best-of lists, I realized that I've never summarized my Weekend Cooking posts. So, in what I hope will be a new yearly tradition, here are my top cookbooks, beverage books, and Weekend Cooking posts for 2012. Click on the links for the full reviews. 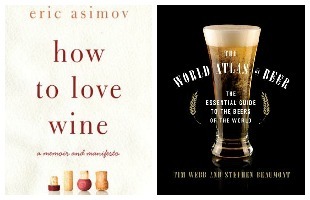 Although I reviewed several wonderful cocktail books this year, Eric Asimov's How to Love Wine and Tim Webb and Stephen Beaumont's The World Atlas of Beer get my nod for their staying power. Drink fads come and go, but wine and beer are eternal. Happy, healthy, and safe New Year to you all! you know I have drunk the ATK KoolAid!! It is a great book. And I bought that beer one but have yet to read it. Looking forward to it! I somehow missed the Mom 100 cookbook. I need to seek that one out. Even though I am not always participating I always enjoy reading your posts. Great wrap up of the old year. Great year in review post! I can only speak to MOM 100 and I loved it! I need to take a look at DINNER. I have it here somewhere. I really need to track down a copy of The World Atlas of Beer - I've learned a lot about beer this year, but still have plenty to learn. Heartland is also a favorite of mine - one I use often. I'm grateful to you for the "bean" book. Great fun to read. 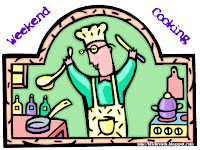 What a great idea to post the 'Best of Weekend Cooking'! 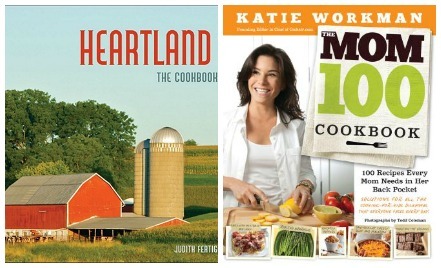 I borrowed 4 of the 5 cookbooks mentioned from the library - all are excellent. I'm off to request Mom 100 now. All of these cookbooks sound wonderful. The Heartland one caught my attention and you're right, you can't go wrong with Cook's Illustrated. You read and reviewed some wonderful cookbooks this year. Love the idea of posting a Best Of Weekend Cooking. Thank you so much for hosting this each week. I got my boyfriend's brother the World Atlas of Beer for Christmas and he absolutely loved it. He is always one of the hardest people to shop for but he does love beer and wine so usually those are somewhat safe territories. I am going to give Cooks Illustrated a look. I saw The Lebanese Kitchen at the store yesterday, it looked good. I just did not want to pay $40 for it. I love the Mom 100 cookbook also. Still need to read Dinner; the love story. It's fun looking back at all that you've shared with us. Thank you for a great Weekend Cooking year. I want to know how big your cookbook shelf is?? Or is it a room of it's own? I'm so glad Heartland is on your list! I think my favorite cookbook of the year was Homemade Pantry, but I *just* got Jerusalem: A Cookbook from the library, and that's been getting a lot of praise, so it might turn out to be my favorite. As for drinks, I loved Bitters: A History. It won the James Beard award and this is one of the rare times where I 100% agree with an award. Lovely book full of great information and recipes. Fun to see these all pulled together! Some great cooking and eating happened in 2012! I'm not normally the type to buy cook books(they take up space reserved for fiction books on my shelf, and I prefer to find free recipes online), but I think I might have to make an exception for Dinner: A Love Story. Sounds like one I might actually read/use. Looks like some good cookbooks, Beth! I love to cook bur rarely use or buy cookbooks - weird, huh? My main source if inspiration is Cooking Light magazine (as you now by now!) and I rarely use anything else....sometimes recipes clipped from other magazines. However, I keep hearing great things about the Mom 100 Cookbook - I really should give that one a try! Nice round-up from the year - thanks! I really enjoyed your wrap-up post, and I have a few of those cookbooks that I enjoy as well. Have a Happy New Year! I've just downloaded Mom 100 because of you. I'm adding Bean by Bean to my reading list. Happy New Year! What a great way to recap a year of Weekend Cooking. I hope you don't mind, but I decided to do the same thing! Thanks for the inspiration! Here's to another fabulous year in the kitchen, restaurants and with plenty of cookbooks on our shelves! Great idea summarizing the cookbooks. I didn't participate in Weekend Cooking as much as I would have liked. I need to keep that camera ready when I cook! I think I spent too much time photographing birds. I ALMOST ordered the Cooks Illustrated cookbook the other day but opted for Cookwise instead. It's still on my list though! And I love The Mom 100--and I have Dinner, A Love Story but haven't had a chance to really dive into it yet. It's been a few months since I did a Weekend Cooking but I look forward to joining back up in the new year.